"I invented this recipe the year our pear tree had too many pears. I serve it on very special occasions but can be made for everyday meals too." This creamy, tangy salad has a delicious crunch from the pecans. Needs a lot more stuff. Found it very bland. This was very good. I prepared the salads individually on salad plates and fanned the pears for a more elegant look. Everyone really enjoyed this salad. great recipe. Used canned pears, they wont turn brown. 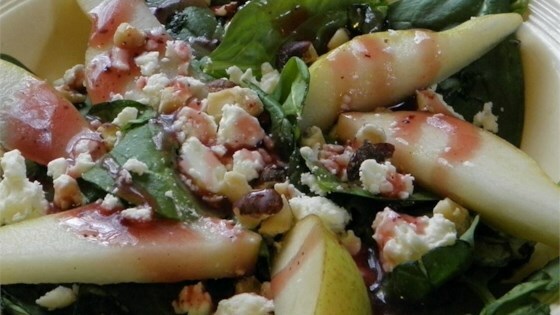 Made individual salads with fanned pears and then sprinkled with pomegranate seeds. beautiful Christmas salad.